When you have done all that you can, count your blessings, express your gratitude and start all over again. Take time to celebrate, breathe, refresh and recharge. In a cycle that has been continuous since 1919, Optimist Clubs begin a new year tomorrow. "The local Optimist Club is trying to change the town for the better one project at a time." That is a most wonderful sentence for any Optimist Club member. Someone has taken notice. Someone cares. Someone gets us. For this story that someone is Emma Despain, a high school journalist writing for her high school newspaper and blog in Jackson, Missouri. The Squawler may be read in full here. When our children take notice of community development efforts, projects and programs that make a community a better place to live, we know that we are making an impact. I'm often told that the younger generation doesn't care or they just take things for granted. Statements like the one above allow me to disagree with proof. I also appreciate that the young journalist has grasped the concept of time. Broad sweeping change isn't going to happen quickly. Real change that matters does take place one step - one project - at a time. Never underestimate the ability of a group of people to turn a routine gathering into a fun experience for all. It might be a witty story, motivational cheer, or perhaps just that one quirky individual that likes to dress for the occasion - in costume. The Optimist Club of Twin Falls, Idaho recently held their installation of officers at an evening dinner gathering. The soon-to-be secretary/treasurer decided it was the night to be Zorro. I didn't know about this particular tradition, but he (real name Dennis Bowyer) comes to each installation banquet in a new and different costume. Whether it's an icebreaker for him or just something he likes to do, other club members look forward to seeing who he will be each year. It's fun to have traditions. What are some of yours? This week marks the end and the beginning of a year in the life of an Optimist Club member. Thursday is my last day as governor of the Pacific Northwest District-Optimist International. It's been a good year, full of challenges and the rewards that come from knowing that I gave it my all. I am happy and sad with the transition that will take place later this week. On October 1, new Optimist Club and District leaders will launch their fresh approach to serving their communities. That's a good thing. We all need enthusiasm and new individuals to lead our charge. For the first time ever, Districts have been asked to forgo their usual quarterly meetings in place of a regional gathering. Incoming International President Danny Rodgers has been actively promoting the "Parallel District Conferences" and information from the International Office remind us several times a week to register for the "PDC - coming to a region near you." For my entire career in Optimism, I have always believed that the beauty of the organization is its local impact. In fact, hands-on support for the clubs in my district was a major part of my work plan this year. I realize we live in a global society. I value the connections I can make from a larger network. But I still wonder if trying to drive Optimist Club member participation from a central point is a good thing. It's not a bad thing; but it is different, and as much as I encourage people to be flexible and adapt to change, I believe it is okay to ask questions and determine what is right for you and those who are in your care. Good luck to the regions with PDCs. Good luck to the one region without. I look forward to reviewing the outcomes next year at this time. Author Daniel Pink talks about what motivates people in his new book Drive and you can see a quick synopsis in this YouTube video. You may be surprised to learn that studies at MIT and Carnegie Mellon Universities and reproduced by psychologists and anthropologists around the world have shown that bonuses actually lead to a diminishing return on creative tasks. According to Pink, our employees and volunteers respond better when they are given autonomy, mastery and purpose. Take a look. I've heard of tractor pulls, but today is the first time I have ever heard of a pedal pull. I had to do research to find out if a pedal pull was what I thought it was and sure enough, I discovered that a pedal pull is youngsters on pedal-powered tractors doing exactly what their motorized counterparts do. The National Pedal Pulling Championships are taking place today at the Corn Palace in Mitchell, South Dakota. I guess I found out about the activity just in time. Please take a look at the children in action and you'll agree, it is an activity that brings joy. I imagine that is why the Marshalltown Noon Optimist Club of Iowa host their own pedal pull event. 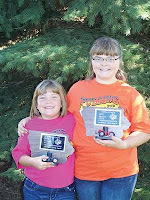 Sisters Becca and Lexi Mohlis participated in the Iowa State championships and won in their age divisions. 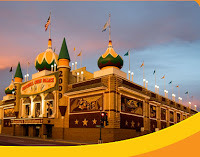 Becca even qualified to participate in the National Championships today at the Corn Palace. Good luck! Photo courtesy of the Marshalltown Noon Optimist Club. September 30 marks the end of the year for Optimist Clubs. Right now, Optimist Clubs around the world are holding installation banquets and thanking their members for all the work they have done throughout the year. It's a time to celebrate. In Boone, North Carolina, the Optimist Club celebrates their volunteer of the year with an unique award: The Big Kid Award. This award is designed to recognize an adult who has demonstrated exceptional commitment to being "a friend of youth," the Optimist Club's motto. I like it. Why not start a Big Kid Award in your Optimist Club? I don't always agree with Seth Godin, and that's okay. I still read his blog every day because his musings generally make me think or give me an idea to try or a reason to improve on something. You don't have to agree with everyone and everything in order to learn and grow. In fact, the very definition of learning might be the opposite of unabashed agreement and acceptance because in order to learn, one must know how to ask questions, perform research, develop an informed opinion, be willing to demonstrate and defend their position, and be flexible enough to change their mind. Of course this post is really about change: not being afraid to try new methods, champion new ideas and lead the way even when others don't agree with you. It is difficult to turn your back on naysayers, but sometimes that is the only thing that will allow the next best thing to happen. Don't be so afraid of your own success that you allow yourself to embrace their negativity for fear of failure. You won't fail if you try, learn, and try again. The annual Easter Egg Hunt is one of the favorite projects for the Optimist Club of Meridian, Idaho. They have held one on the Saturday before Easter every year for 37 years. One of the things they do that is slightly different than other Easter Egg Hunts is they provide thousands of dollars worth of prizes for the lucky egg holders. Most everyone goes home with a prize as well as the candy they've collected. If the club sees someone who didn't find a prize egg, they try to be sure they get something too. As you can imagine, that's a lot of gifts to buy. This year, a local department store (that asked to remain anonymous) made a contribution to the Optimist Club so they will have even more prizes next year. Shown here are Rod Shaul and Susan Thompson sorting out their largess. 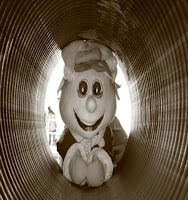 Get ready Meridian kiddos for the biggest Easter Egg Hunt ever coming in 2011! I'm not sure if I'm shocked, thrilled or in awe about the Jacksonsville, Maryland Optimist Club website. It is packed full of information about their club projects,where they meet and how to join. Plus it has dozens upon dozens of back pages opening up to more information about the zone, district and Optimist International than one can digest in one viewing. Imagine this, the landing page is three home pages in one or more specifically, 12 pages when printed on legal size paper. Wow! Navigation is a good thing. There is nothing wrong with giving your readers some directions as to how to best get around your site and find the information they need. Very simple tabs for Home, About Us, Projects, Membership, Optimist International, and District would make it so much easier to find information and much less overwhelming. Bullet points rock. Pictures and stories are interesting, but online people are busy people. They want fast, concise information and often less is more. It is good to have choices for your prospective new members; however information overload can cause indecision if it is difficult to figure where one might fit in or how they can make a difference. 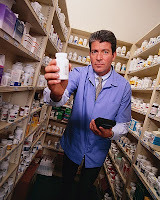 Make it easy for others to participate by helping them sort through the information you provide in a timely manner. Make it easy for everyone to say, "Yes, I want to be involved." 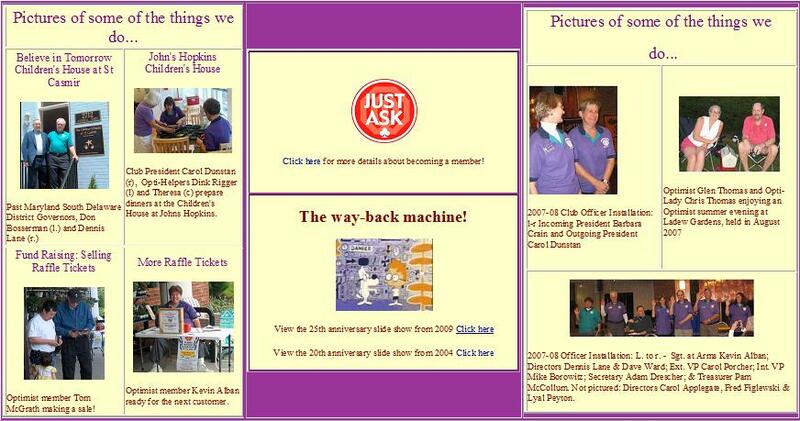 The pictures represent approximately one third of the Jacksonville Optimist Club home page. The Grand Strand Optimist Club of Myrtle Beach got a little help from a local TV station to tell their story this week. The club donated sunglasses to the children of the Miracle League baseball team. Not only did they get a lot of smiles as thank you's, they also got this great plug that encourages people to join the Optimist Club. Yesterday, my friends in the Beaverton Optimist Club were busy. 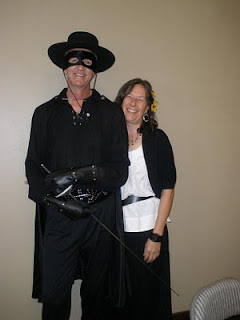 They manned a booth at the Farmer's Market, raised money for children with cancer for the Oregon Candlelighter's group and participated in a parade. But this post isn't about what they did, but rather about how simple it is to tell others about your activities. Alan Zehntbauer, a member in the club, took a few pictures and then uploaded them to the club's blog at www.beavertonoptimistclub.blogspot.com. That 's it. No fancy writing, just a quick update to let club members, the community, and others who care to know that they are an active group. Please take a look and if you haven't started a blog for your Optimist Club yet, please do so today. Need help? Please send me a message. This is a post about simplicity. The Democratic National Party unveiled a new logo this week. Some were quick to yawn and call it boring; others called it ugly, and still others claim it was dated. I think it is genius. Why? Its simplicity is timeless and in a world that reduces words to symbols, this does it well. Some might question the obvious use of blue in the light of the "blue state, red state" debate and the need for unity. However, there is red where it matters. If I intuit this logo correctly, red is needed to make the change that matters. Others might say the color palette and circle too closely resemble President Obama's logo and to rebrand with one person in mind is unwise. I believe, however, that the similarity will remind the public to stand solidly together for what they thought was overwhelmingly right during the last election. It is a call for unity. Simplicity draws us in. When something is easy to understand, we become interested. Unity keeps us there, working together for common goals. If a logo can deliver both simplicity and unity, well, I think it is sending the right message. I don't speak French; therefore I don't visit the websites of our French Canadian Optimist Clubs in Quebec very often. However, I took a quick trip this morning in order to find a club that I might introduce to you in the same way as I did yesterday for the club in Jamaica. What popped up first was the Optimist Club of Amos and with help from Google translate via my Chrome browser, I was able to meet Snowflake, the mascot of the annual Magic Snow activity performed by the Amos Optimist Club. According to the website, Magic Snow brings happiness with giant snow tube slides, dog sleds, sleighs, and snowmobiles, and all types of winter carnival fun. Additionally, all money raised is redistributed to the community in the form of grants for youth-oriented projects. Are you up for a trip to Quebec in February? If so, please be sure to visit the Amos Optimist Club. Want to visit an Optimist Club closer to home? Find one here. The Optimist Club of Sunset Liquanea in Kingston, Jamaica invites you to find out more about the projects and purposes of their Optimist Club and Optimist International. As you enter you meet club President Patrick, read their mission statement "Building capacities through teamwork and participation" and find out how engaged this club is in society's challenges as they work to bring out the best in kids. You can meet the members of the Sunset Optimist Club, find out about their sponsors and then move on to their blog with pictures and stories from many of their projects. As of today, the most recent project was completing a playground at the Marie Atkins Basic School. 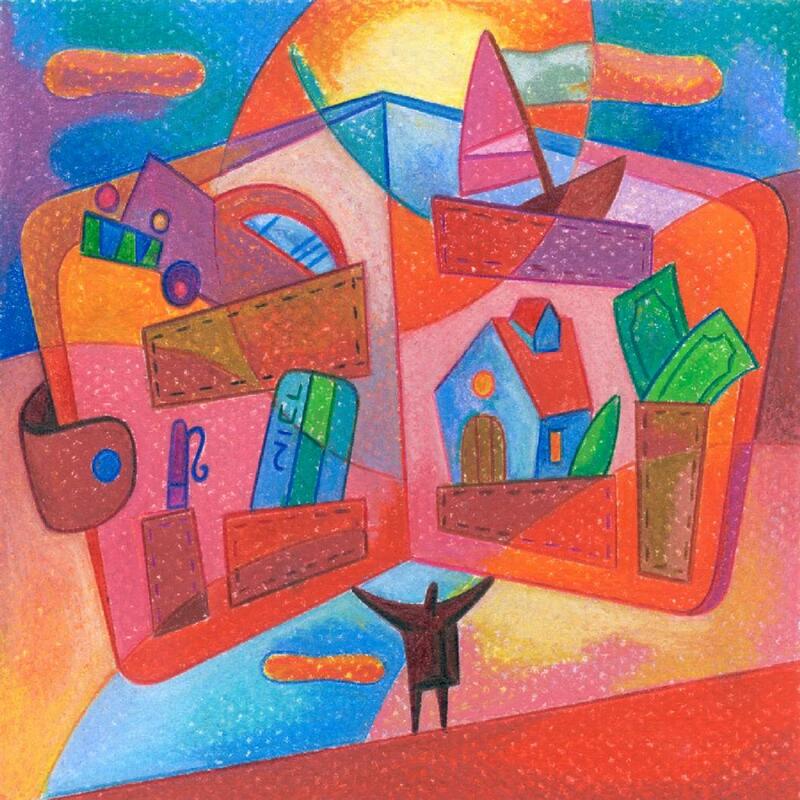 Please click here to see the wonderfully colorful and heartwarming pictures. 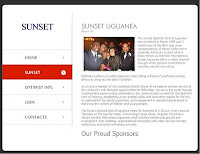 I hope you enjoy your online visit to Jamaica via the Sunset Liguanea Optimist Club. 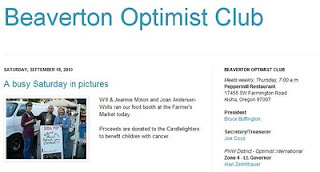 The Optimist Club of Watertown, South Dakota has started a blog. On the home page they have a picture of their members and they say, "Get to know us!" So that's what I wanted to do today. Please allow me to introduce you to the great folks and Optimist Club members in Watertown. Click here to visit their blog. Like our club yesterday, you can see that Optimist Club members are different ages, blending different personalities, project and styles. I bet you can find a club to fit your style too. 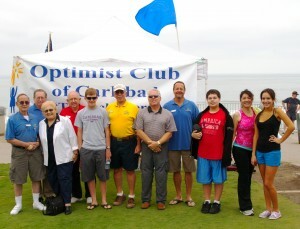 Please click here to find an Optimist Club near you. Sun, beach, optimism: What more could you ask for? The Optimist Club of Carlsbad, California, affectionately dubbed "The Achievers", set up an informational exhibit last weekend to raise community awareness for Optimist Club youth programs. Members of all ages were on hand to talk about their involvement with the Special Olympics, Eric Sears 5K Run, scholarships, oratorical and essay contests, and Eagle Scout projects. What I like most about the project is the picture. It reminds us that Optimist Clubs are ageless; you are welcome to join and participate, no matter how old or young you are. The Carlsbad Optimist Club welcomes new members at 8:00 a.m. every Saturday at the El Camino Country Club, 3202 Vista Way, Oceanside; information: 760-458-5222. Thank you to CALSO Governor Lucille Lemeiux (third from left) for the project idea. Spurred on by the extra attention that the new Optimist Club gained from Jay Leno, I've been watching the progress of the Port City Optimist Club in Wilmington, North Carolina from a distance. After all, it is rather far away from Idaho so most of my knowledge comes from what I find in the media. Today I was excited to see them mentioned again. I was even more impressed with why. The Port City Optimist Club has established a new fund at the Betty H.Cameron Women's and Children's Hospital at New Hanover Regional Medical Center to support children who have pharmaceutical needs that are beyond their means. 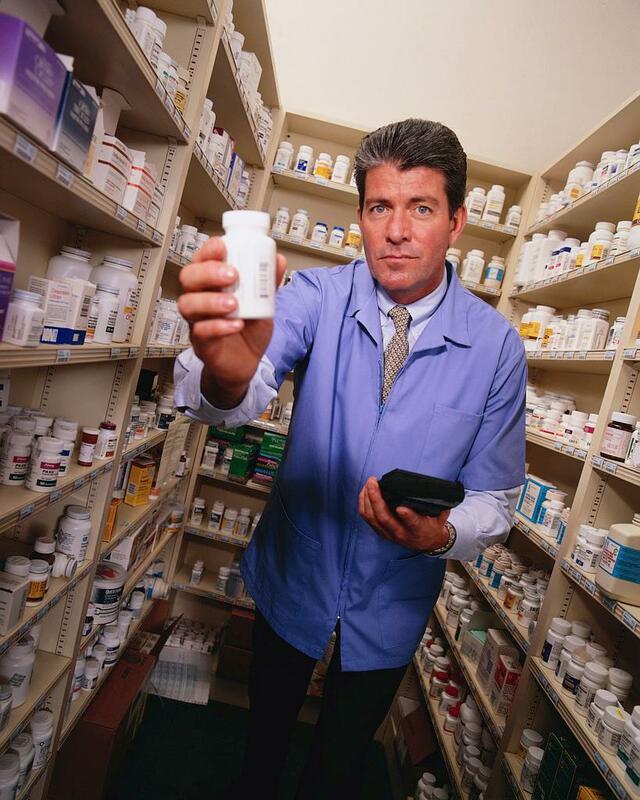 The Pediatric Pharmacy Fund will assist when insurance, Medicaid, and the family's own resources are overextended. According to president Lori Harris, they hope to inspire other Optimist Clubs to contribute and help serve all children in the area. A new, resourceful and inspirational project from a new Optimist Club. This is real proof that new Optimist Clubs bring fresh ideas and resources to the table. Thank you! I live in Idaho. While not everyone shares the same political views, the state is known to be very conservative with religious undertones that fuel the residents' core beliefs. This may not surprise you, but often the conservatism seems to border on extreme nationalism and to some degree intolerance. This is one reason that I really enjoy my Optimist Club; political views are left outside of the meeting. Not so much that we have our heads in the sand in regards to current events, but we find if we are all working towards positive solutions, we don't have to necessarily agree on what causes society's problems. After all, no one thing contributes to any success, failure or shortcoming; however, the unity of many diverse experiences increases our chances to overcome any challenge. We are stronger because we share many voices, attitudes, personalities, strengths and even weaknesses and as an Optimist Club, it is our responsibility to find, promote and live for the most positive solutions. That's what community building is all about whether the community is online, in a club, organization, neighborhood, city, state or country. Others will try to detract. Others will spread negativity and even fear. I believe that when we stand together in optimism, we will find the faith to expect only the best in all people and bring out the best in ourselves. This post was inspired by the events memorializing 9/11 and the belief that we must be very cautious lest our fear turn into hate. I believe that as a nation, we are better than that. 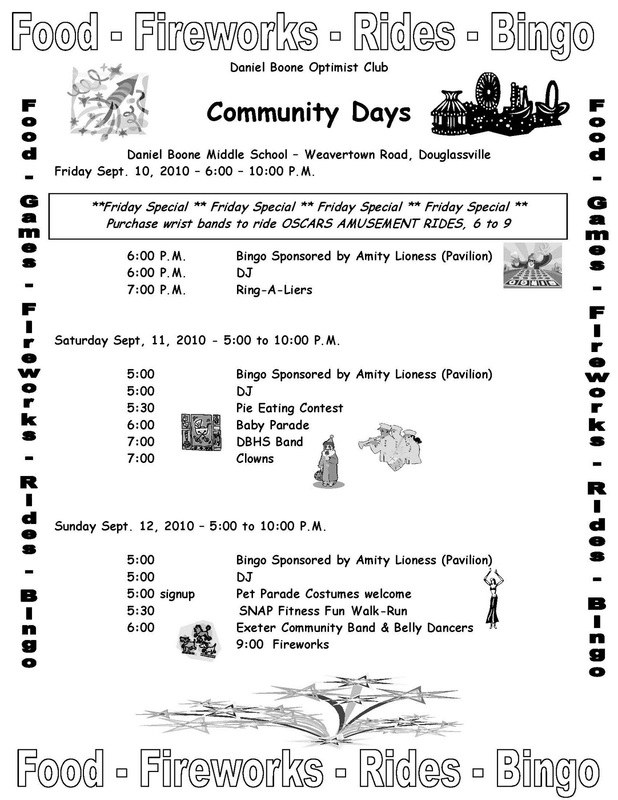 After thirty years of coordinating Community Days in Douglassville, PA, the Daniel Boone Optimist Club is proud to report that the event is still growing. This year they moved locations to accommodate more people to the family friendly event, added a pet parade and a 5k walk/run. More than 30 organizations are hosting booths or activities this year.Popular returning activities are Bingo, the Baby Parade, pony rides and carnival rides and of course there will be food and entertainment. According to Optimist Club president Sue Fleming it is a nice community event. "You get to meet your neighbors and see what is going on in the community," she explained. She also reminds the community that the Optimist Club is always welcoming member volunteers to help organize the event and carry out other activities that help make Douglassville a great place to live. To find out more, visit www.danielbooneoptimist.com. Sometimes a reminder that even some of our best-known leaders had setbacks, disappointments and failures in their lives is all it takes to get motivated. I like this simple message and hope you do too. Remember to keep a positive attitude through all life's trials. Optimism is the faith that will help you achieve your goals. Optimist International offers three separate scholarship contests for students through the age of 19. With school just starting, now is a great time to look at the topics and to plan to get your Optimist Club, classroom or child involved. Optimist International Essay Contest: "How My Education is the Key to a Successful Future"
Optimist International Oratorical Contest: "If I Were Leader of the Free World, the First Issue I Would Address Would be ... "
Optimist International Communications Contest for the Deaf and Hard of Hearing: "If I Were Leader of the Free World, the First Issue I Would Address Would be ... "
Every contest begins at the Optimist Club level in your local community, but general information can be found at the above links. 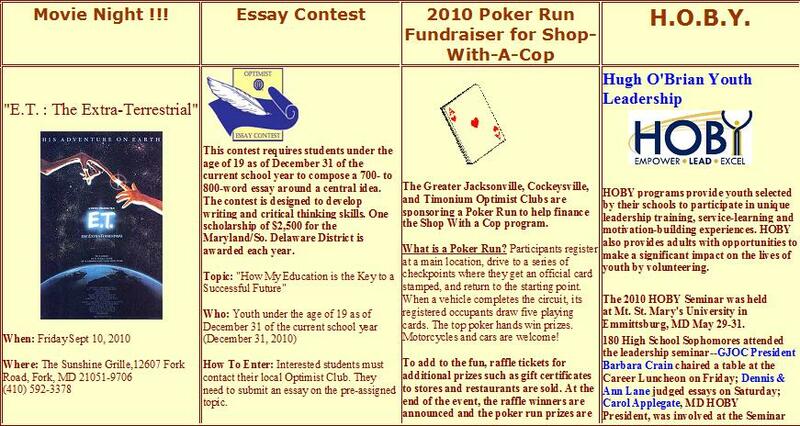 The Essay Contest is completed in February and the Oratorical Contests are completed in May. All participants have the opportunity to earn scholarships up to $2,500 while they practice their communication skills. Check the Optimist Club Directory to find a club near you. I have very quick post today and a shout-out to fellow blogger Dennis Voy of Maquoketa, Iowa. Dennis writes Dennis's Daily Report for KMAQ Radio and he has highlighted the community service efforts of the Maquoketa Optimist Club for placing flags in the community, including residential streets, for the national holidays. He points out that the flags are a moneymaker for the many projects that the Optimist Club does for children throughout the year, but more importantly, thanks to the efforts of the Optimist Club and the support they receive from the community, Maquoketa, Iowa is known as the US Flag City of Iowa. Click here to go to Dennis's Daily Report. Some see Labor Day as the last official hurrah of summer. Others see it as a lazy day away from work. I've usually recognized it as the day to stop wearing white pants and shoes, but the day was set aside in the United States and Canada in 1894 as a way to celebrate working men and women. The first Labor Day Parade occurred on September 5, 1882 in New York City. The date was chosen by workers' unions who placed it half way between Independence Day and Thanksgiving and the idea then spread across the countries, possibly recognizing the need for a day of respite, and most certainly recognizing the need of praise for the men and women who toil to make the economy strong. However, the best reasoning for celebrating Labor Day that I have found comes from Samuel Gompers, founder and longtime president of the American Federation of Labor, who said, "Labor Day differs in every essential way from the other holidays of the year in any country. All other holidays are in a more or less degree connected with conflicts and battles of man's prowess over man, of strife and discord for greed and power, of glories achieved by one nation over another. 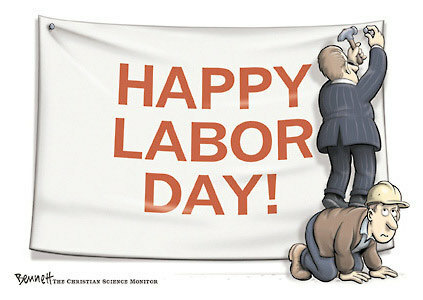 Labor Day...is devoted to no man, living or dead, to no sect, race, or nation." I agree Mr. Gompers, our positive forward-moving actions, equal and diverse, are cause for celebration. Find out what is most important about your company, product or passion in less than two minutes. Thank you Mr. Tom Peters. The Optimist Club of Des Plaines, Illinois adopted the Plainfield Elementary School for their first-ever school supply drive. And what a supply drive it was! The Optimist Club reached out to members and were rewarded with an SUV-load of crayons, paper, pencils, binders and more supplies than were expected. It took a flat-bed dolly to move the supplies inside and once inside the kiddos were there to help sort, stack and distribute the supplies to others. As we know, the economic situation has made it especially tough for families to send their children back to school. School supply drives are becoming much more common amongst Optimist Clubs. Thanks to the Des Plaines Optimist Club for the pictures, the story and especially for serving your community. In regional golf news, the Great Falls Tribune in Great Falls, Montana reports that the Uptown Optimist Club Golf Tournament was a success. They raised more than $10,000 and involved many local movers, shakers and regular folks in the process. Awards were given as well as kudos and praise and a great number of people got to find out a little bit more about what Optimist Clubs do. Over the years, the Optimist Club has raised more than $210,000 and donated it to local charities including the Childhood Cancer Campaign. This year, the beneficiary sounds a little different as the Optimist Club is retaining the money to buy parking lot striping machines. Now that is awesome! In an earlier post I commented long and hard about an Optimist Club is part of the economic development program for a community. While parking lot striping machines may not be as glamorous or heartwarming as giving to something like the Childhood Cancer Campaign, it is something that the community needs to make Great Falls a better place to live. 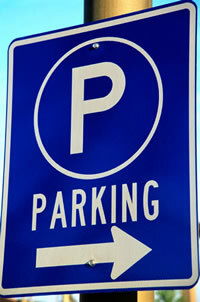 Many parking lots are managed and return money to the owners, often a branch of another economic development entity, and then that money goes towards more community improvements. Thanks to the Uptown Optimist Club for not being afraid to make an unglamorous donation. 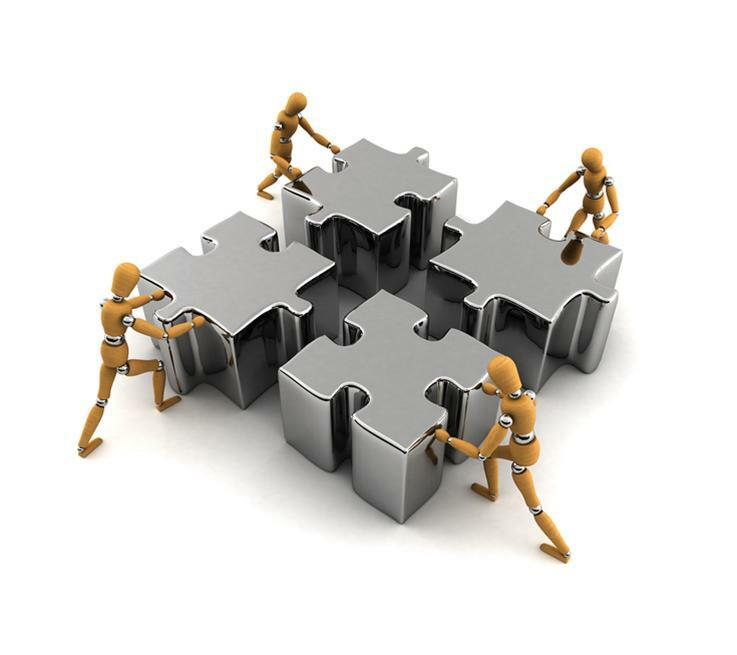 Your community is a better place to live because of your well-rounded efforts. Optimist Clubs serve local communities. Members raise money and give their time to perform projects that make a difference at home. Since we live in a global society, I know that may seem narrow-minded to some. However, I think that knowing someone is helping at home makes it that much easier to donate to causes where money is all that we can give. Watch the movement of Toms Shoes and enjoy the thank yous from around the world then give them a look next time you want to make a difference far away from home. Thank you. The President of the Optimist Club of Wahpeton/Breckenridge serves the twin towns of Wahpeton, North Dakota and Breckenridge, Minnesota. At least once a year during football season, that is like serving two masters as the community ramps up for the rivalry. What's a club to do? Hold a fundraiser! 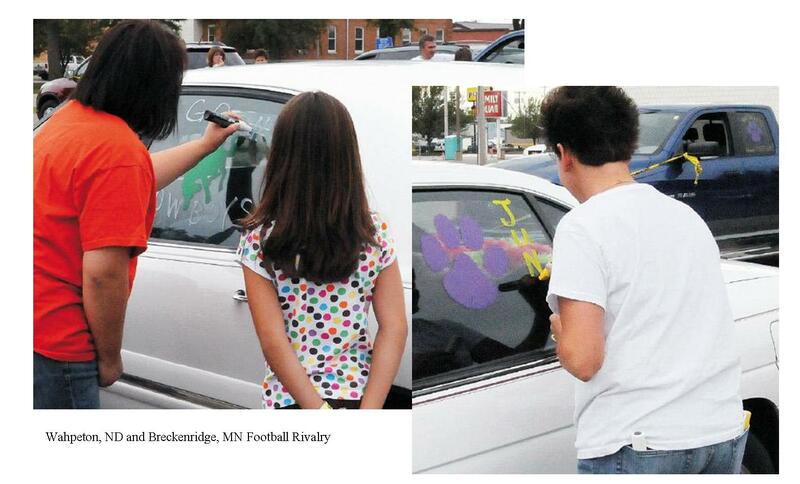 For a donation of your choice, the Optimist Club paints car windows and decorates vehicles in the team colors. Then they donate the proceeds to the booster clubs for each team. This year the Wahpeton fans were more enthusiastic giving $553 to the Breckenridge's fans with $415. Nearly was $1,000 raised for the crosstown rivalry. Now that's team spirit. Story first reported in the Daily News for Wahpeton, ND and Breckenridge, MN. The ninth annual Sugar River Bike Tour to help fight childhood cancer will be held on Saturday, September 25 in Brodhead, Wisconsin. The event is sponsored by the Brodhead Optimist Club and for a $30 donation, bicyclists can choose to ride East 50 miles, West 50 miles. Following the tour, a hot lunch and goodies are provided. 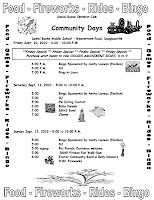 The Sugar River Bike Tour is part of the the Brodhead community's Autumnfest. Participants can also enjoy a Family Farm Bike Tour, Farmers/Craft Market, Pumpkin Carving and Scarecrow Building, Chili Contest, Bake-off, Hayrides and Trick or Treating for those in costume. There is also music entertainment an the Poopapalooza Cow Pie Bingo. Now who doesn't want to attend this fall festival?